Shown below is a 1974 photo of Bail Electronics Services' staff. From left are Fred Swart, Greg Whiter, Fred Bail, Jim Bail and Brian Stephens. This photo was taken inside Bail's showroom, which was co-located with Fred Bail's private residence at 60 Shannon Street, Box Hill North, Victoria, Australia. Fred Bail passed away in the late 1970's, Jim Bail passed away in the early 1980's, Brian Stephens passed away in late 2018. Although the Showroom/Workshop building has now been removed, the residence still exists today and, until late 2002 was still in the hands of Fred Bail's widow, Gladys Bail. In 2002 Gladys Bail passed away. Seen in the background are some of Yaesu's product range of 1974, including an FT-101B on the bench between Greg Whiter and Fred Bail. Shown above is a view of Yaesu's factory at Fukushima in northern Japan. The photo was taken in the early 1970's and is of the FT-101 production line. 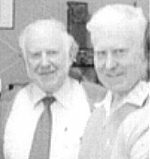 Fred Bail and Malcolm White, a Bail's staff member in the early 1970's, are shown above at an amateur radio convention at Leongatha, Victoria.